A heterogeneous mixture is simply any mixture that is not uniform in composition - it's a non-uniform mixture of smaller constituent parts. Using various means, the parts in the mixture can be separated from one another. A bowl of Fruit Loops cereal is a heterogeneous mixture because it has cereal bits of many colors floating around in milk. A bottle of balsamic vinaigrette salad dressing is a mixture that is heterogeneous, and has to be shaken up to make the mixture appear and taste more combined. Rocks in the sand at the beach are a heterogeneous mixture - all different shapes, sizes and colors - just thrown together at random. Smog is a heterogeneous mixture of various particles suspended in the air. The dirty particles that make up the smog can be removed from the air and breathed into the lungs, making smog quite a problematic heterogeneous mixture. 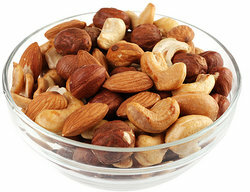 Mixed nuts at a party is a type of heterogeneous mixture that can be separated simply by pouring them onto a table and sorting them into separate piles, each of the same nut. A puddle of mud counts as a heterogeneous mixture - dirt, leaves, grasses, animal byproducts - all blended together in water. Pizza is a heterogeneous mixture of dough, sauce, cheese, and other toppings. A bowl of oatmeal with raisins is a heterogeneous mixture. A salad with lettuce, cheese, seeds, tomatoes, broccoli, and other vegetables is an example of a heterogeneous mixture. The Pacific Ocean is a huge example of a heterogeneous mixture, with all type of plants and animals floating around haphazardly, suspended in the salt water. A bowl of candy like M&Ms, Skittles, or jelly beans is a heterogeneous mixture, with a non-uniform variety of colors and flavors represented in a single bowl. Soil is an example of a heterogeneous mixture that combines many different elements which are not uniform. Hollandaise sauce on your eggs may not look like a heterogeneous mixture - but it is! It's a special type of mixture called an emulsion that can break apart into its constituent pieces (butter, egg yolks, and lemon juice). An atom is a heterogeneous mixture of various parts such as protons, electrons, and neutrons. As demonstrated with nuclear weapons, atoms can actually be split apart using certain methods. Sand is a heterogeneous mixture of rock, shells, metals, and other elements, which can be separated from each other by methods like sifting. Vinegar and oil are often mixed together as a condiment, but the mixture itself is heterogeneous. They may stay together for a while, but they're sure to be broken apart after a while. You will encounter many of these types of heterogeneous mixtures every day not just in scientific labs but in the real world, so be on the lookout for them everywhere. "Examples of Heterogeneous Mixture." YourDictionary, n.d. Web. 23 April 2019. <https://examples.yourdictionary.com/examples-of-heterogeneous-mixture.html>. A heterogeneous mixture is simply any mixture that is not uniform in composition – it’s a non-uniform mixture of smaller constituent parts. Using various means, the parts in the mixture can be separated from one another.